If you live in area that gets a lot of snow fall; Getting a snow plow should be considered. Without one, you can potentially get stuck in deep snow or may be prevented from reaching your destination because of being blocked from getting there. Having a snow plow, which you could easily attach to the front of your truck, would work in clearing the path ahead. This can save you time and hassle. Tow Straps is another accessory that should be considering getting if you live in an area, or may have to drive through an area, that gets a lot of snow fall. You may not be able to avoid getting stuck in snow every time the possible risk occurs, and so having tow straps would allow you to handle the situation yourself by getting your truck effectively out. Another accessory that can save you time and hassle. 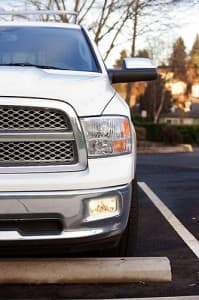 Every driver should have fog lights installed on their truck for the winter. Poor visibility because of snow or fog is never a good thing for a driver of any vehicle. Fog lights will help diminish the obstructions blocking your view so that you can see better to reach your destination safely. It’s also a good idea to have a portable jump starter on hand because you never know when the cold weather will cause your battery to die. Without one of these you could be stranded, potentially for hours, waiting for someone to come and help you. This will allow you to get your truck working again so you can get back on the road sooner. At least consider getting jumper cables if you don’t want to lug the portable jump starter around. This way, if you get stranded with a dead battery and someone happens to come by, you’ll be in luck with getting a jump start even if they don’t have jumper cables of their own. And most importantly, especially if you have no winter accessories of any kind for your pickup truck, it’s best to at least have a car cellphone charger so you’ll be able to call for help if necessary.